(PHOTO: REUTERS/Murad Sezer)Ecumenical Patriarch Bartholomew I (R) leads a special Sunday mass after the Synaxis at the Patriarchal Church of St. George in Istanbul March 9, 2014. At the invitation of Ecumenical Patriarch Bartholomew I, heads of Orthodox churches met at the Greek Orthodox Patriarchate in Istanbul. Synaxis is the meeting of all the heads of the Orthodox Churches. Patriarch Theodoros II of Alexandria and All Africa is seen on the left. 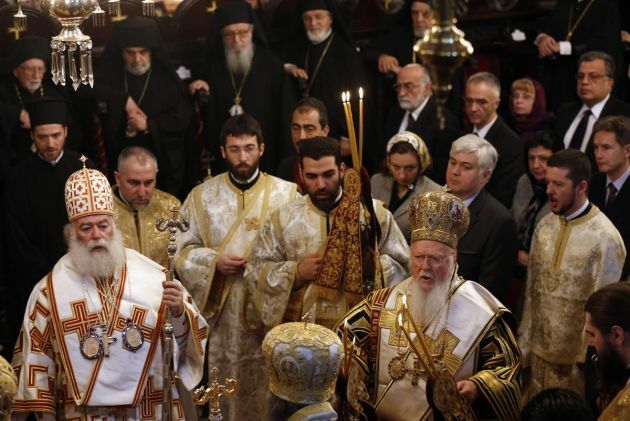 ISTANBUL (Reuters) - Patriarchs of the world's 250 million Orthodox Christians ended a rare summit in Istanbul on Sunday calling for a peaceful end to the crisis in Ukraine and denouncing violence driving Christians out of the Middle East. On the Middle East, the patriarchs denounced "the lack of peace and stability, which is prompting Christians to abandon the land where our LordJesus Christ was born." Despite the prestige of his post, he has no authority over other churches, unlike the power the pope has in Catholicism, the world's largest churchwith 1.2 billion members.